My wavy Indique extensions have been getting so much love in the Internet streets! Everyone has been asking and emailing me questions about my Indique hair. All my Atlanta ladies are in luck! Indique just opened their 10th boutique in the Virginia Highlands area in Atlanta! Indique is the top luxury hair extension brand in the US! Why? Because they manufacture their own hair so they have total control of the product. 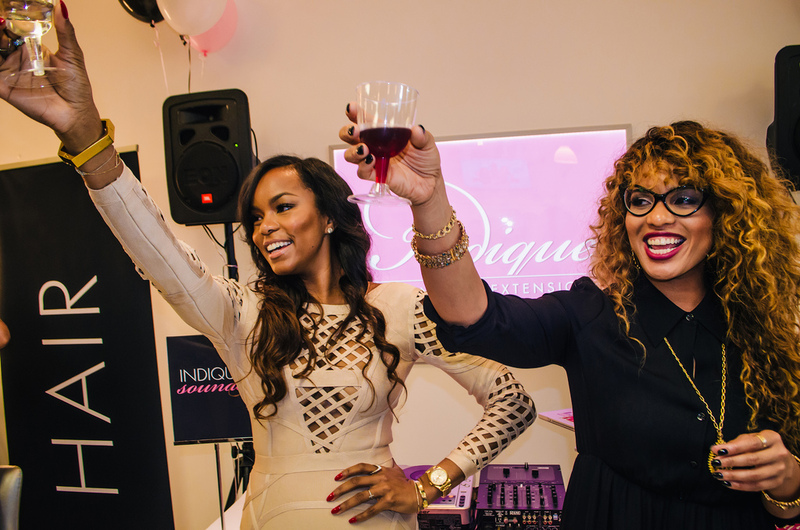 Celebrating with the Co-founder and creative director of Indique, Ericka Dotson. Ladies and gents were lined up around the building to get into the new boutique! Indique gave away 50 tubes of hair to the first 50 guest! You know folks were camped out! Mariah from Married to Medicine with Ericka, event host, LeToya Luckett and DJ Princes Cut. Cheers! Just like the Indique hair, the event was fabulous! Guest enjoyed a fun photo booth, complimentary manicures Nail Talk, eyebrow threading, and makeup stations…a candy bar, bite-sized sweets, and Ice Cream Cellar Wines. Make sure you stop in and visit Indique Atlanta! They are located at 312 N. Highland Ave. NE Suite C, Atlanta, GA. They also have locations in Boston, Philadelphia, Chicago, NJ, NYC and South Africa! *I am an Indique ambassador and received a gift from Indique to support the event. Thoughts and opinions are my own. Weekend Style: Justin Bieber Party! Wheeeet…. look at them folks in that line… they want that hair BABY! lol! OAN: You loik amazing… loving your hair and that FIT! U can gone and gimme them pants! HA! Wow! What a large turn out! Love those pants! Wish I could have gone! This looks fabulous. Love your pants and shoes the best. I still adore your hair like that. Looks so easy!